Beaches reopened Sunday with extra lifeguards along a stretch of the Florida Panhandle coast where a shark killed a 14-year-old girl, as coastal residents reported seeing at least one shark hunting fish close to shore. Jamie Marie Daigle of Gonzales, La., was swimming on a boogie board with a friend at least 100 yards from shore when she was attacked Saturday in the Gulf of Mexico, said Walton County sheriff's Capt. Danny Glidewell. Jamie was vacationing with friends while the rest of her family was home. Daigle was in an area not protected by sandbars or lifeguards when she was bitten, said the surfer who hauled her onto his board and headed for shore with the shark trailing them. "The beach is the beach. Once you get past that second sandbar, you're in the gulf," said Tim Dicus, who pulled the unconscious girl onto his surfboard. "And when you're in the gulf, that's where big fish are. You go way down on the food chain." An autopsy was planned for Monday, and a shark expert was invited to attend to help determine the type and size of the shark involved, Glidewell said Sunday. After the attack Saturday, a 20-mile stretch of shore was closed to swimmers, with twin red flags warning people to stay out of the water, but beaches reopened Sunday with a double staff of sheriff's beach patrol officers, Glidewell said. Florida averages 33 shark attacks per year, more than any place on earth, CBS News Correspondent Mark Strassmann reports. Though deadly, attacks are rare. Residents of a condominium complex next to the beach where the girl was attacked said they spotted a shark that looked about 6 feet long Sunday morning. "It was just right at the shoreline," said Jason Miller, who lives in a 10th-floor condo. He took pictures of the shark chasing fish while people stood in the white surf. Although Jamie and her friend were farther from shore than recommended, it is common for boogie-boarders, surfers and people on personal watercraft to go beyond the two sandbars that separate the shallow beach area from the open gulf, Glidewell said. "Our pilots who fly our helicopters have always reported to us that if you look offshore, there's always a large number of sharks - always has been because that's their natural habitat," Glidewell said. Dicus, 54, said he heard a scream and saw Jamie's friend swimming for shore as fast as she could. Jamie was face down in a bloody circle of water, and the flesh had been torn on one leg from her hip to her knee. 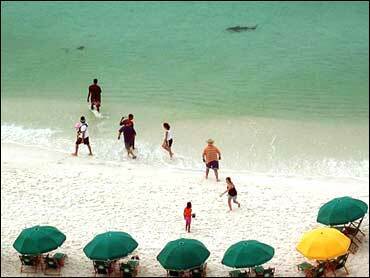 The shark, which was right next to her, appeared to be a bull shark about 8 feet long, Dicus said. "He just followed us right to the beach," he said. "He wanted his meal back real bad," Dicus told Strassmann. "With every stroke I kept telling, 'C'mon baby, you're going to make it,' and telling myself, 'Here it comes. Any second I'm going to feel numbing pain in some limb.'" Two other swimmers came with a raft and used it to help carry Jamie to shore. The surfer said he punched the shark on the nose when it tried to attack him. Paramedics were unable to revive the girl. Florida averaged more than 30 shark attacks a year from 2000 to 2003, but there were only 12 attacks off the state's coast last year, according to statistics compiled by the American Elasmobranch Society and the Florida Museum of Natural History. George Burgess, curator of the International Shark Attack File at University of Florida, said Sunday that bull sharks are common in the area, are aggressive and can be found in shallow water. He said that of 500 documented attacks in Florida, the fatality rate was 2.4 percent. "Sharks are one of many hazards that one may encounter when entering the sea," he said. "There is no reason to think that this is the beginning of a trend."